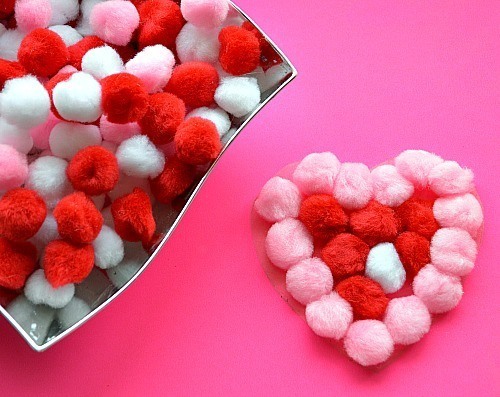 Easy Valentine Craft for kids using contact paper and pom poms. 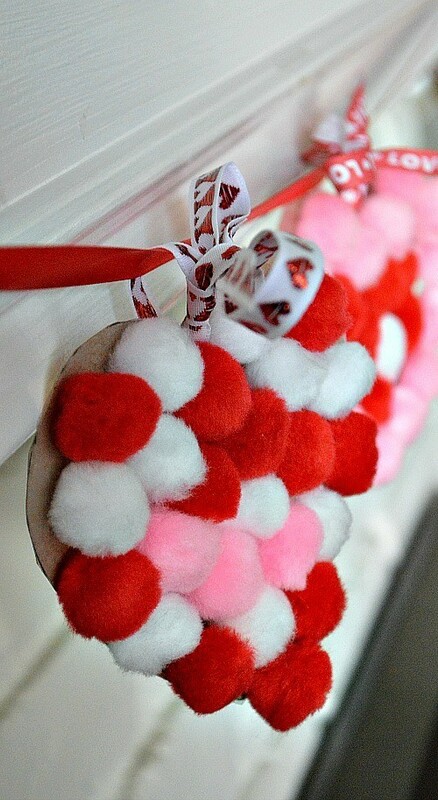 This simple pom poms craft turns into a beautiful pompom hearts garland! Follow Kids Play Box’s board Valentines on Pinterest. After you have your hearts, use the same hearts outline to cut out 6 hearts from an old cereal box or cardboard. 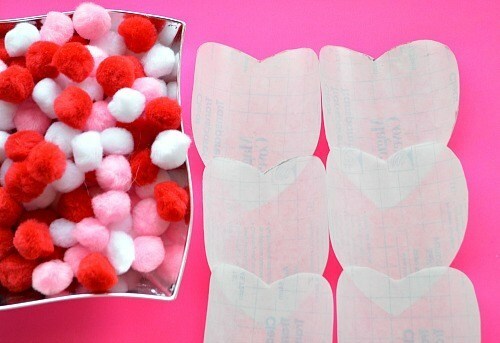 Just when you are ready for this Valentine craft, peel the backing from the contact paper and use glue to adhere the non-sticky side to the cardboard heart cut outs leaving the sticky part of the contact paper up. With the sticky side up, now the sticky hearts are ready to be prettied up. 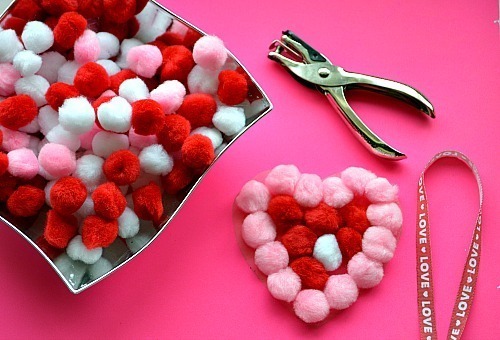 With the use of contact paper, this pom poms craft has instantly become a toddler Valentine craft. The kids can decorate, sticky, pattern to their hearts content. 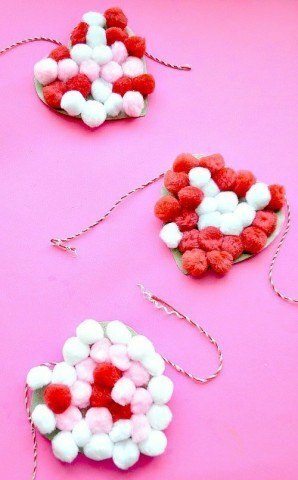 You can incorporate so many learning concepts with this Valentine craft activity. Think counting, skip counting, colors, patterning, addition. Aside that this craft is a fantastic fine motor exercise. How easy can a Valentine craft get? Isn’t this heart gorgeous? Punch a small hole on top of all the hearts and string pretty Valentine themed ribbons through them. I enjoyed watching the kids create with the colorful pom poms. After tying them up in hearts ribbons we set up the whole garland over the fireplace. The sticky part of the contact paper was strong enough to hold all the pom poms together. 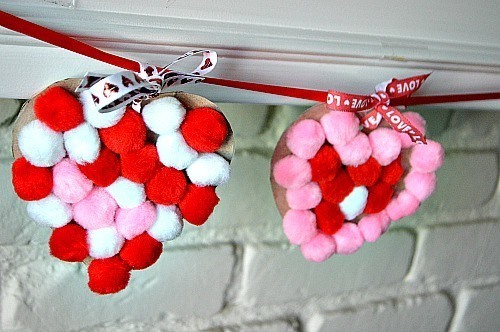 I encouraged the kids to place all the pom poms as close as possible so the hearts will have a fuller look. Perfect for the season! Our mantle looks so festive, colorful and gorgeous.